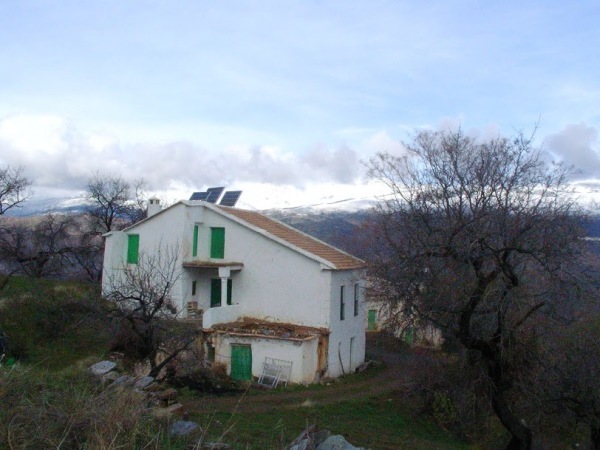 The Cultural department made a law 2008 that all the dwellings should be as authentic as possible from this era in the Alpujarras. All the villages and farms are really authentic. Granada is one of the last recognized DOP wine regions in Spain. The Junta Andalucia has endorsed the region for 6 years and has made a Wine Route, Ruta de La Vino. The vineyards enjoy the unique microclimate due to the location in the Alpujarras between the Mediterranean and the mighty Sierra Nevada with an altitude of 3480 meters. Very few Wineries are just 30 minutes from the beach in Andalucia, the high altitude of 1050 meters makes it suitable to grow high-quality grapes with a minimal use of pesticides. We are also organic and certified by Agrocolor. We have also plantations of roughly 1500 Almond trees, 600 Fig trees, 40 Olive (oil) trees. Bodega Cortijo el Medico means "The Doctors Winery and Farm", the word Cortijo means it is a farm situated in Andalucia. See it on Google Maps here. Main house with the winery in the background 2017....Now it is reverted back 500 years into these Moorish rural style buildings.